March 8th, 2011 8:26 AM by Lehel S.
Just one in four of the 2.7 million homeowners who sought to participate in the Obama administration's signature mortgage assistance program have succeeded in getting their monthly payments reduced. The rest failed to qualify for the program or were disqualified after they were initially accepted into the program, according to an analysis by the Wall Street Journal of data on applicants to the program newly released by the Treasury Department. In all, about 680,000 homeowners who applied for the Home Affordable Modification Program, or HAMP, had received permanent modifications of their loans and were making timely payments or were still in the trial phase as of December. Almost 6.7 million U.S. homes were lost to foreclosure, short sales or turned back to lenders between 2000 and 2010, according to Moody's Analytics. 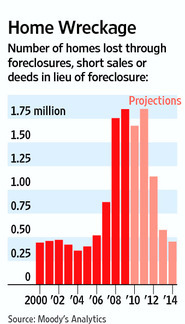 Another 3.6 million could meet the same fate through 2013. The White House launched the HAMP program in 2009 as a broad attempt to reverse the rising number of home foreclosures by reducing families' mortgage payments, typically by lowering the interest rate and extending the term of a loan. But the administration's strict eligibility criteria resulted in far lower participation than expected. This translated into a smaller cost to taxpayers. Two years ago, the Obama administration said as much as $75 billion would be needed for HAMP. About $1 billion has been spent so far. The program has faced sharp criticism. Neil Barofsky, the departing special inspector general overseeing the program, has faulted the administration for launching it with inadequate analysis and only partially developed guidelines. This led to delays and confusion, and the program "continues to fall short of any meaningful standard of success," he said a report released in January. House Republicans have called the program a waste of money and are considering a bill this week to end the program. "In an era of record-breaking deficits, it's time to pull the plug on these programs that are actually doing more harm than good for struggling homeowners," Rep. Spencer Bachus (R., Ala.) said last week. Treasury spokeswoman Andrea Risotto said the program helped establish standards across the loan servicing industry and prompted the industry to make more private modifications. The Republican legislation "would close the door to struggling homeowners seeking relief in the face of the worst housing crisis in generations," she said. The program offers payments to more than 100 mortgage servicers if they successfully complete loan modifications. It has tighter qualification criteria for admission than loan modification programs offered by individual banks or other lenders. Homeowners who are accepted into the program have to get through a trial period of at least three months before their modifications are made permanent. Almost half of the applicants to the program, or about 1.3 million homeowners, were declared ineligible from the start. Applicants were most often rejected because they didn't submit the necessary paperwork, or it was lost by their mortgage company. Nearly 266,000 applicants were denied for this reason. Another 255,000 were ineligible because they were considered to have affordable mortgages, defined as less than 31% of pretax income. Borrowers also were turned down because they had loans for more than $730,000 or were not considered in danger of defaulting soon. Another 770,000 homeowners started the program but were later disqualified, most for the same paperwork and eligibility problems as the applicants turned away at the outset. Only a small number were rejected for failing to make trial payments. Homeowners in southern states had the hardest time getting into the program and staying there. In the four-state region of Arkansas, Louisiana, Oklahoma and Texas, about 83% of applying homeowners failed to complete the loan-modification process. That proportion was 80% in the four-state region of Alabama, Kentucky, Mississippi and Tennessee. Homeowners had the least trouble getting into the program in New England, where the rejection rate was 72%, and in western states, including Alaska, California, Hawaii, Oregon and Washington.